Ready? Let’s make dinner. 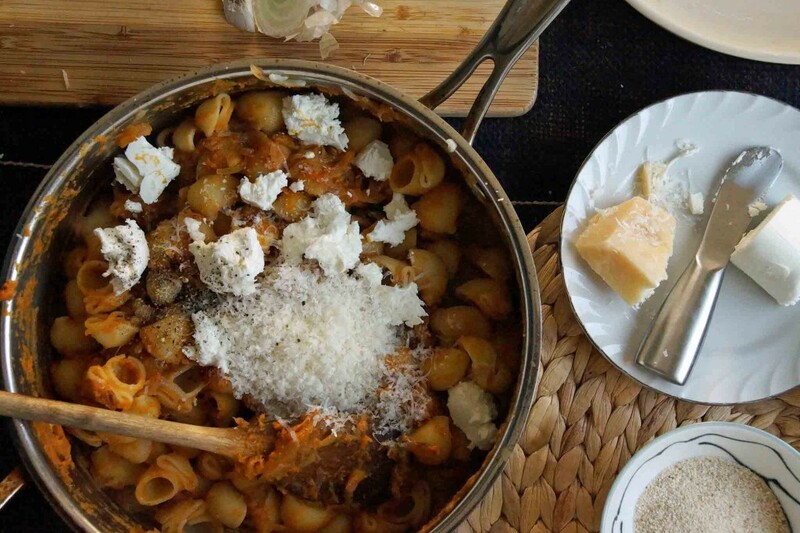 Grab that half can of pumpkin out of the fridge, a few onions, fresh sage, chèvre, parmesan, and breadcrumbs. As for the pasta? I used “pipe rigate” which are adorable, kind of chubby, bent pipes. Shells or your favorite bite-sized noodle will work just as well. Put a pot of water on to boil, preheat your oven, and start caramelizing onions. We’re going to make this a quick caramelization job. Keep the heat almost to medium and don’t wander too far while they’re doing their thing. Add a bit of fresh sage to really bring home the fall flavors. 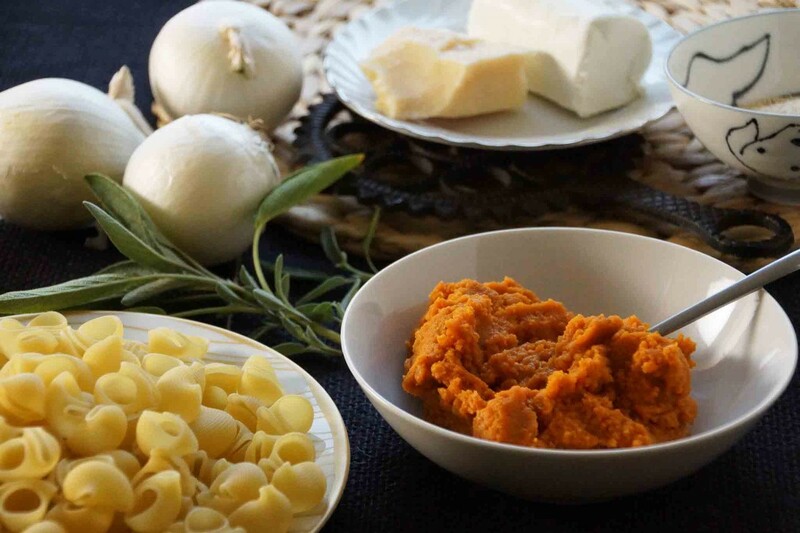 When the pasta is almost al dente, add the pumpkin to the onions. Splash in a ladleful of the pasta water to loosen the mixture into a saucy consistency. Check the pasta. Ready? Perfect! Pull it out of the pot with a slotted spoon and add it to the pumpkin sauce. Stir and coat. 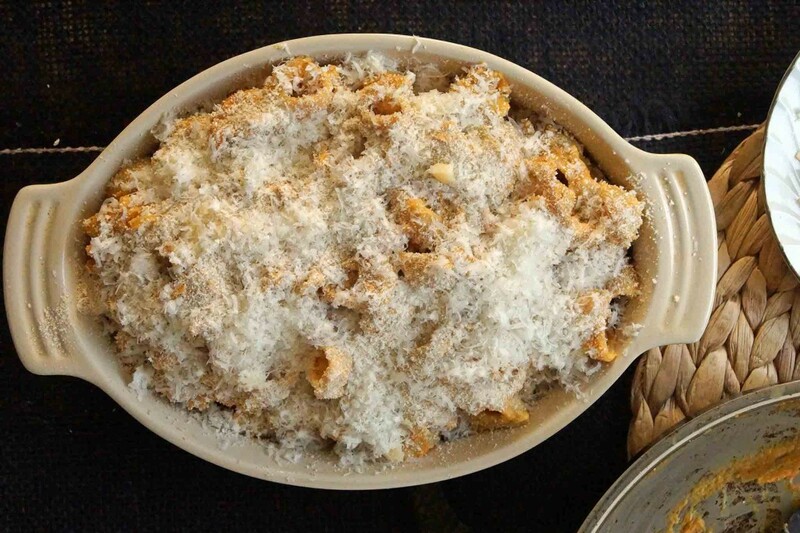 …but we’re going to bake it with breadcrumbs and more parmesan so it gets a crispy, crunchy top. Yum. The pasta will emerge from the oven with a crunchy, toasted top, warm and creamy interior: perfect fall comfort food. Thank goodness for those pesky recipes that leave you with a half of a can of pumpkin. 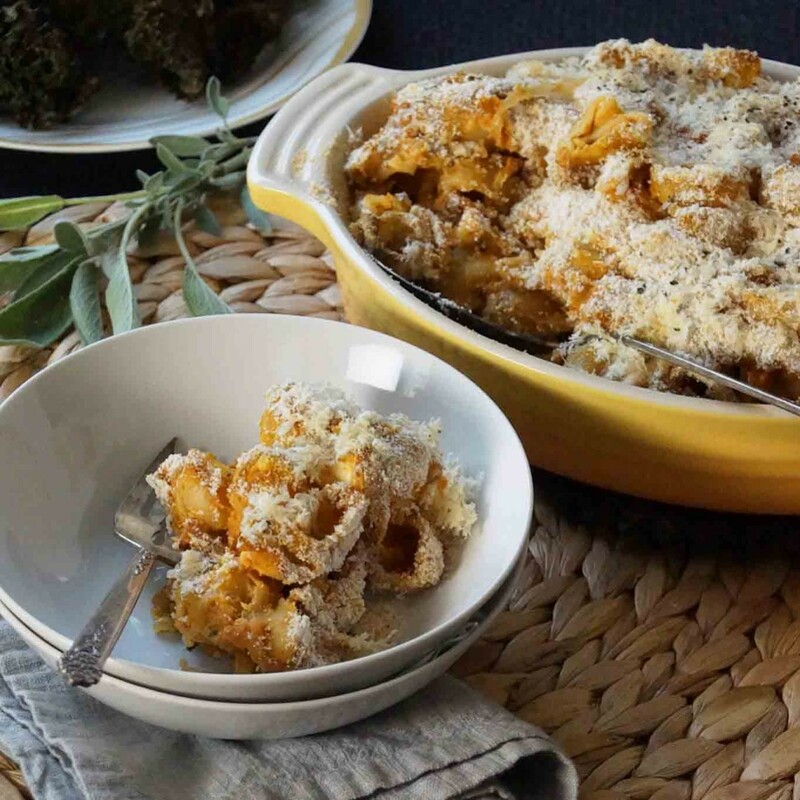 Paired with a simple salad or sautéed greens, this baked pasta is a perfect dinner for chilly fall evenings. While you wait for the water to boil, start caramelizing the onions. Heat about 1 Tbsp. olive oil in a wide pan over medium heat. Add the onions and sprinkle with salt. Stir often. After the onions have started to shrink down and take on a little color (about 10 minutes), add the sage and lower the heat slightly. At this point, your water should be boiling. Cook the pasta, according to package instructions, until al dente. Meanwhile, preheat the oven to 400°. Butter a small baking dish. 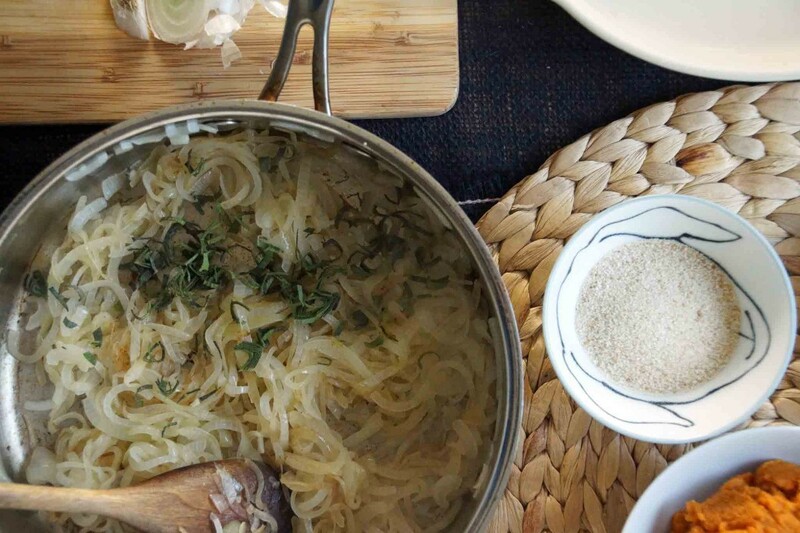 Back to the onions--as your pasta nears finishing, the onions should be golden and sweet. Add the pumpkin puree to the onions. 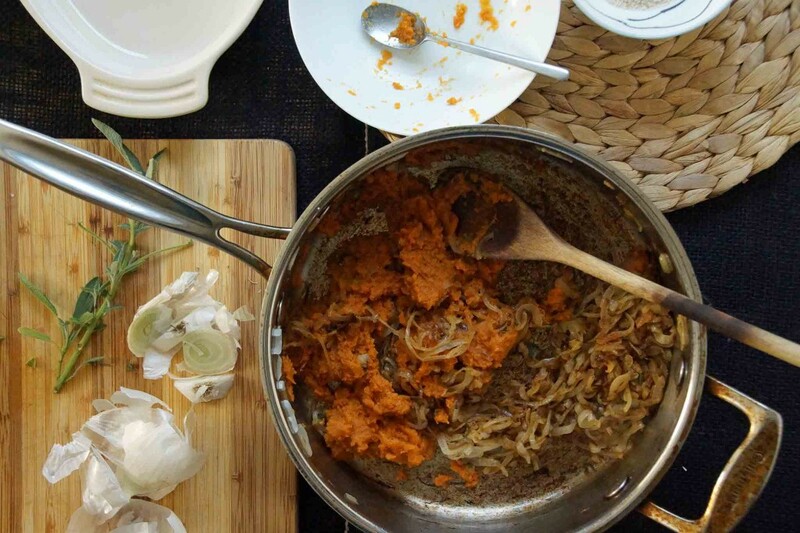 Add a ¼-1/2 c. of the pasta cooking water to loosen the pumpkin and help it form a sauce. Taste, season. 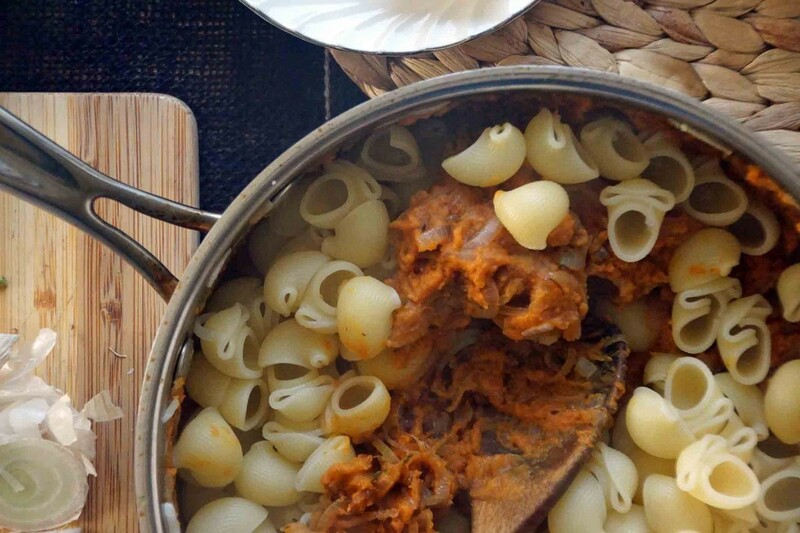 When the pasta is al dente, pull it from the water with a slotted spoon and add it to the pumpkin and onion mixture. Stir until the pasta is well coated. Sprinkle in ¼ c. parmesan. Break the chèvre into a few clumps and stir it into the pasta until melted. Taste again. Season with lots of coarse black pepper and salt, if needed. Transfer the pasta to the prepared baking dish. Top with the breadcrumbs and remaining parmesan. Bake until the top is golden and crispy, about 25 minutes. Ahhh, PASTA! This one really speaks to me! I think I’ll make it when Shirlee Jo and Dave come to stay (are you reading this, Shirlee??) And I’ll make the gingerbread with the other half can of pumpkin – perfect! 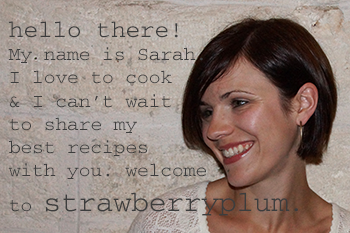 god, everything you make looks & sounds like it should come from a cookbook. a cookbook i’d totally buy, by the way! 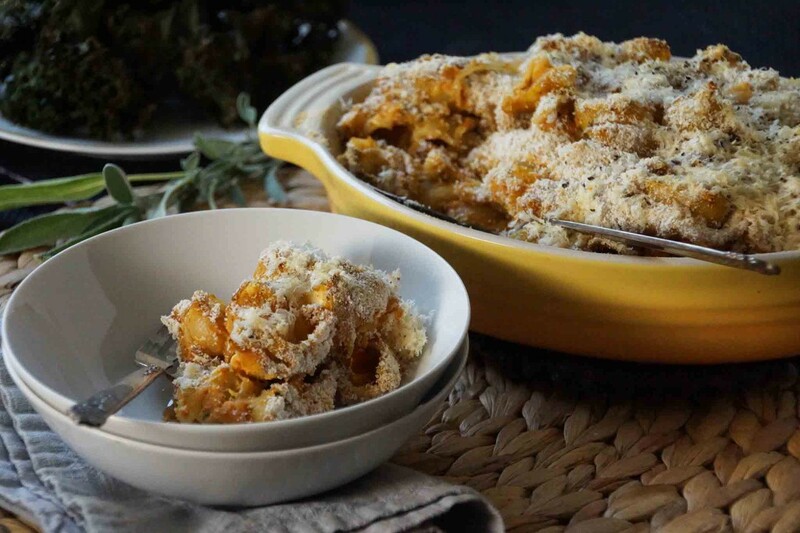 I love the combination of winter squash, chevre, and sage and on top of that you added caramelized onions…I can’t wait to make this! This sounds like a fabulous fall dish. Pumpkin and sage are two of my favorite food pairings. Great recipe! This looks amazing! Even though I just finished eating lunch, my mouth is salivating again! I’ll be saving this to make soon, especially since I have a half can of pumpkin sitting in my fridge at the moment! Heavenly – The flavors are over the top and it gives me a reason to use the Sage Infused Olive Oil I just bought! I actually embrace the 1/2 can of pumpkin – it ‘forces’ me to stir in a couple tablespoons into my oatmeal in the morning! 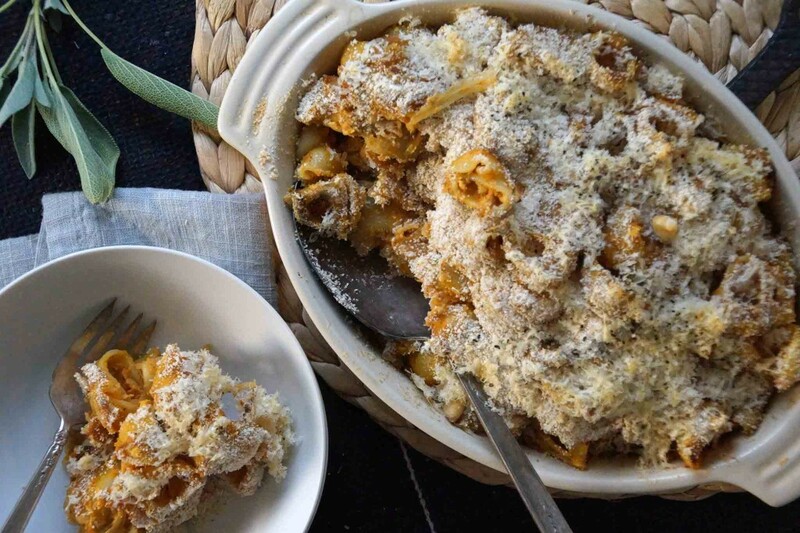 🙂 I look forward to sharing this recipe with my wellness clients as a comfort food option that has more nutrients & better flavor than traditional mac & cheese. Thanks! Thank you, Paula…I will definitely have to try adding pumpkin to my oatmeal now!